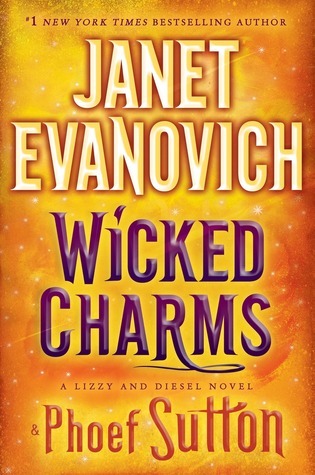 Wicked Charms by Janet Evanovich and Phoef Sutton is the third book in the Lizzy & Diesel series. Murdered and mummified more than ninety years ago, bootlegger Collier "Peg Leg" Dazzle once found and re-hid a famous pirate's treasure somewhere along the coast of New England. A vast collection of gold and silver coins and precious gems, and the bounty also contains the Stone of Avarice- the very item reluctant treasure seeker, Lizzy Tucker, and her partner Diesel, have been enlisted to find. While Lizzy would like to live a quiet, semi-normal life, Diesel is all about the hunt. And this hunt is going to require a genuine treasure map and a ship worthy of sailing the seven seas... or at least getting them from Salem Harbor to Maine. Greed is eternal and insatiable, and Lizzy and Diesel aren't the only ones searching for the lost pirate's chest. There are people who have dedicated their entire lives to finding it, and are willing to commit murder to make a deal with the devil, just to hold the fortune in their hands. One of those people may even be Wulf, Diesel's deceptively charming and enigmatic cousin. Wulf desires the Stone of Avarice. He also desires Lizzy. It's hard to say how far he's willing to go to gain either one. It's a swashbuckling adventure full of raiders, monkeys, minions, and mayhem. Lizzy and Diesel are going to have to do everything they can to keep their heads above water and hope they are living a charmed life. 1. I will pretty much read anything that Janet Evanovich is involved in writing. This book, like so many of hers, is a fun quick read with lots of quirky characters. These book keep me entertained and laughing through out the story. 2. I love Lizzy's character. I can't decided if it more that she longs for a normal life, but still saves the world with Diesel, or that she is pastry chef. Everyone knows that cupcakes are my weakness, and I seriously wish I could try Lizzy's cupcakes. 3. As I said before, I really enjoy the cast of quirky characters. Like Glo, the counter girl at the bakery, who thinks she is a witch and carries around Broom and a spell book. Or Ammon, the eccentric billionaire who thinks that he is the incarnate of one of the princes of hell. The characters keep the books interesting.